The Lourinhã Formation is a geological formation in West Portugal. The formation is Late Jurassic in age (Kimmeridgian/Tithonian) and is notable for containing a fauna similar to that of the Morrison Formation in the United States and the Tendaguru beds in Tanzania. Draconyx is a small bipedal herbivore. 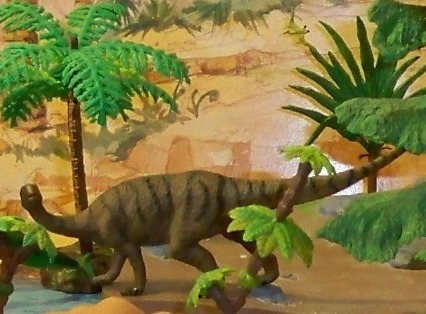 Estimated length is 11 feet a member of the Iguanodontia, specifically the Camptosauridae. Miragaia is its long neck, which was composed of at least 17 vertebrae. This represents the culmination of a trend of longer necks seen in stegosaurians. Miragaia had more neck vertebrae than most sauropods, dinosaurs known for their long necks, which contrasts with the traditional view of stegosaurs as low browsers with short necks. Dacentrurus (meaning "tail full of points"), originally known as Omosaurus, was a large stegosaur. Its type species, Omosaurus armatus, was named in 1875, based on a skeleton found in England. In 1902 the genus was renamed into Dacentrurus because the name Omosaurus had already been used for a crocodilian. It had the same proportions as Stegosaurus, its plate and spike configuration is known to be rather different, as it probably had both two rows of small plates on its neck and two rows of longer spikes along its tail.